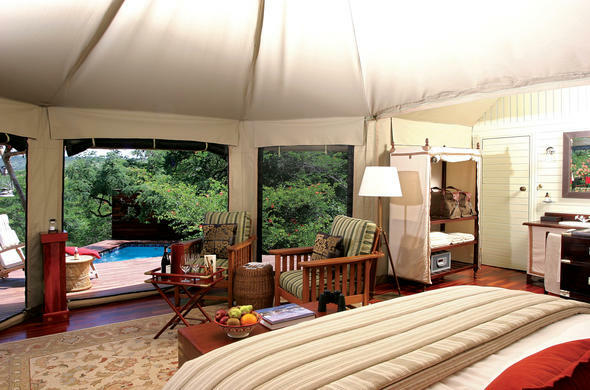 Exclusive, luxury tents at Komati Tented Lodge accommodates guests at the Nkomazi Game Reserve in Mpumalanga. At the Nkomazi Game Reserve, exclusive accommodation is in one of 10 luxury Noble Tents that can sleep a maximum of 2 adults. The tents are strategically placed to blend in with the surrounding bushveld. There is a Royal Suite that boasts a spacious lounge area. Each tent at this Badplaas accommodation has campaign style furniture to blend in with the location and luxury room amenities. Your safari accommodation features comfort cooling and heating facilities, ceiling fan, international dial telephone, tea and coffee making facilities, en-suite bathroom, indoor shower, outdoor bath, private mini bar, electronic safe, hairdryer, international adaptors, and private viewing deck with a plunge pool.